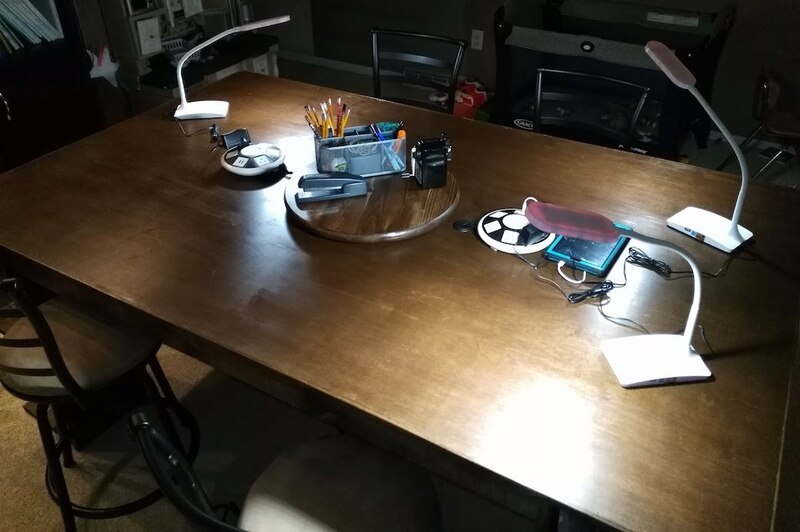 We're a homeschooling family - more accurately, my wife homeschools and I support her in it - and recently she's been asking for a better desk than the two little ones we bought used a few years back. Our family has grown, so the daily school activities now overflow the desks onto the dining room table and pretty much every other surface available. We needed something larger - a single place where they could focus on their school work, that could hold everything they need during the day. Yeah, I could've looked around and bought something. Maybe gotten a couple more small desks. Or a larger desk, but it'd be more expensive and wouldn't have fit our exact requirements. But I find woodworking extremely satisfying after writing bits and bytes all day that exist only in the digital world. I love having the chance to build something, to see a pile of raw materials take shape in front of me. People have asked me if I find plans online. I could, and maybe I will for something. But half the fun for me is thinking these things up, and getting to custom fit them into the space I plan on putting them. Even though I don't follow any pre-made plans for my projects, I do plan it out a lot. 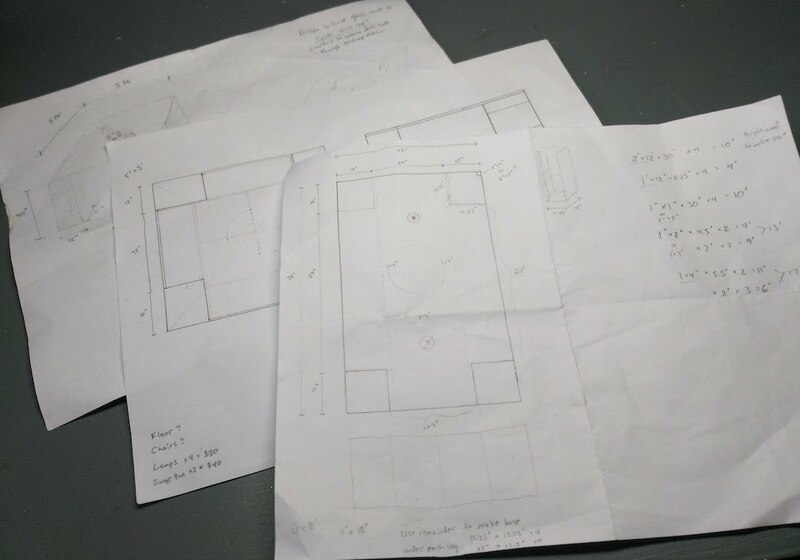 I highly suggest sketching out a few designs, and when you have something you like, figure out the measurements too. There's a lot less waste in the long run, and less runs to the hardware store for more wood and other supplies. One of the more frustrating practices is that lumber - at least what I buy - never exactly matches the description. For instance, a 2" x 12" board is actually 1½" thick and 11¼" wide. A 1" x 12" board is only ¾" x 11¼". Small details like that affect the cuts of other boards, the choice of screws, etc. Sketching everything out beforehand helps me plan out exactly what size, length, and number of boards I want before I step foot in the store. I try to start by thinking about the foundation of whatever I'm building. In the case of this desk, I focused on how I wanted to design the legs, so the table top could rest securely on top. 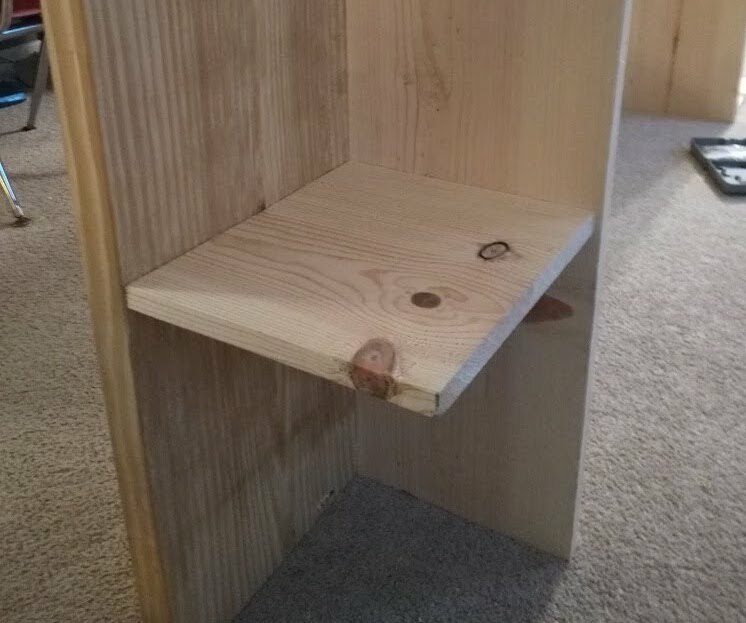 My wife thought some built-in shelving would be nice, so I designed "L" shaped legs to which I could attach shelves later. Each of these boards is 30" high, which is fairly typical for most desks and tables. I probably could've gone a few inches shorter actually, but we needed chairs anyway so we bought ones to work with it. 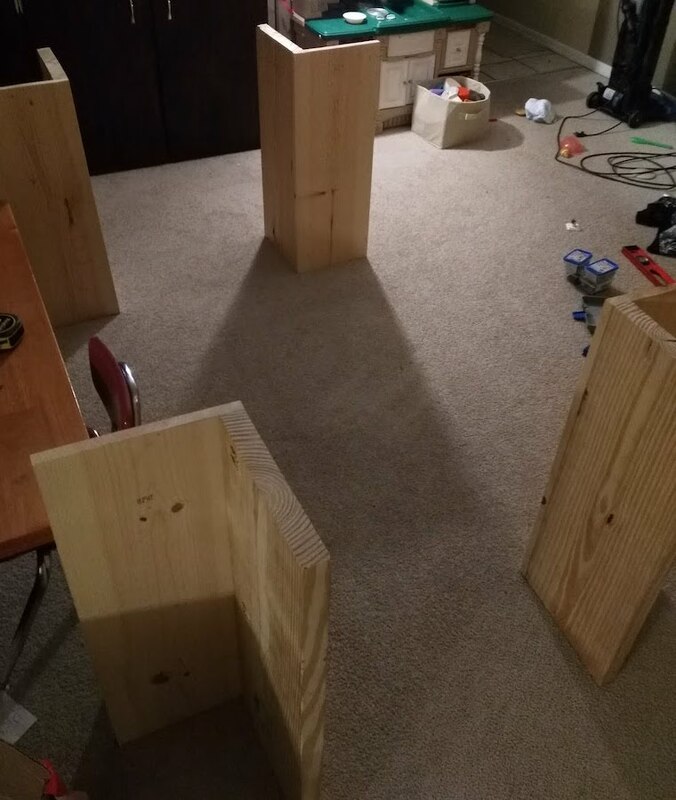 After assembling, I arranged them at the approximate size of the table so I could get a better idea of the relative size compared to the space available in the room. 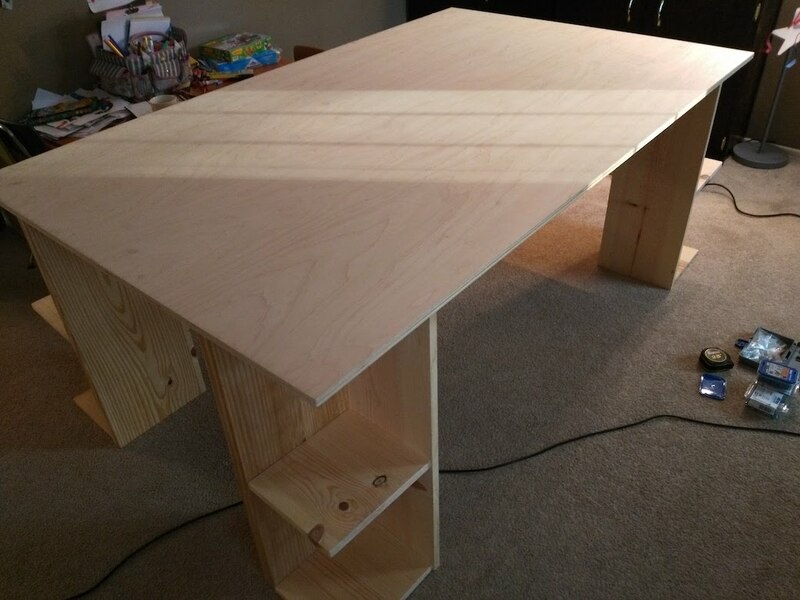 Laminated plywood (the lamination gives it a smooth surface) come in 4' x 8' sheets, and I was planning on a 4' x 6½' desk. At this point I could easily cut the top of the desktop larger or smaller as needed - options are limited once you start hacking away. 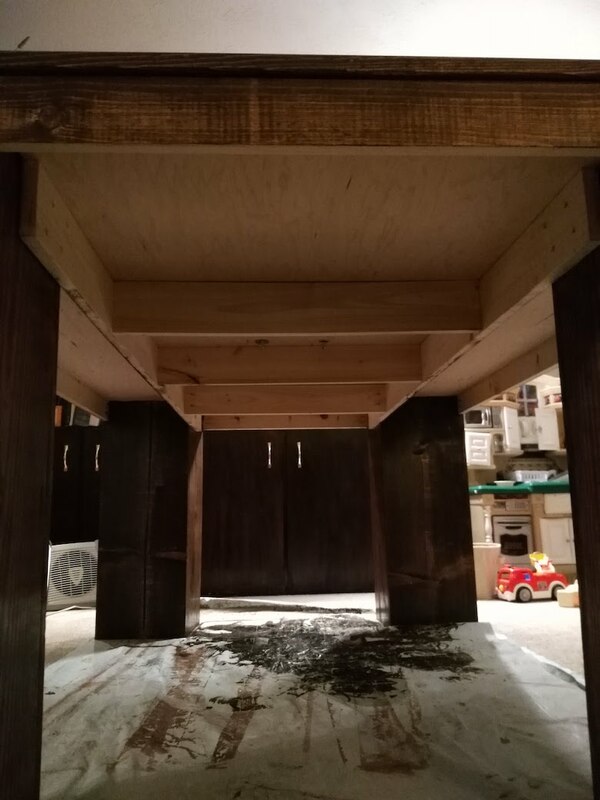 After I built the legs, I was left with an interior area of about 11¼" x 9¾" (since the two boards overlapped a bit as you can see above). 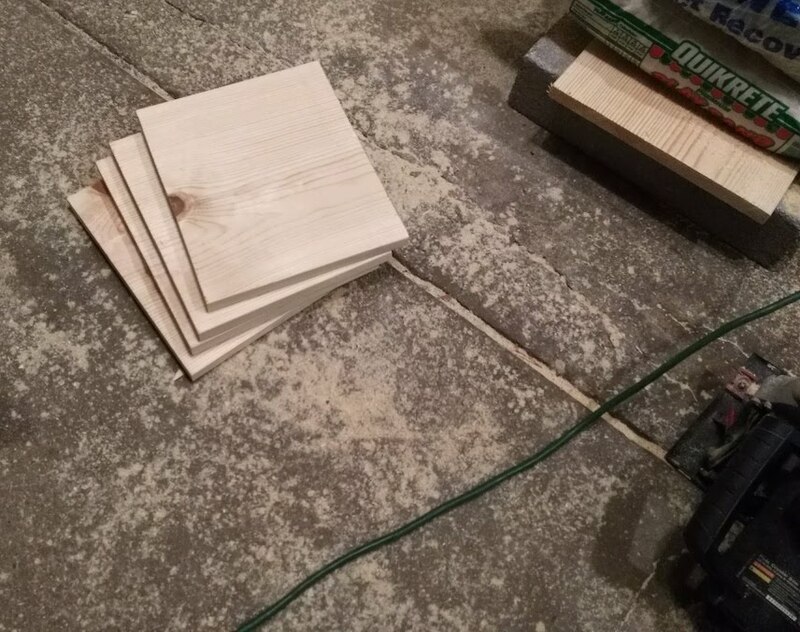 I took some left-over pieces of 1" x 12" board and trimmed a little from each side to fit - I ended up with 11" x 9½" so they wouldn't stick out beyond the legs. For hiding the holes you're drilling, a Kreg set works great. When connecting two boards you have a few options. One is to use a countersink bit so that the screw is hidden beneath the surface of the board you're screwing into - then you can put a little cap on it or hide it with wood putty. 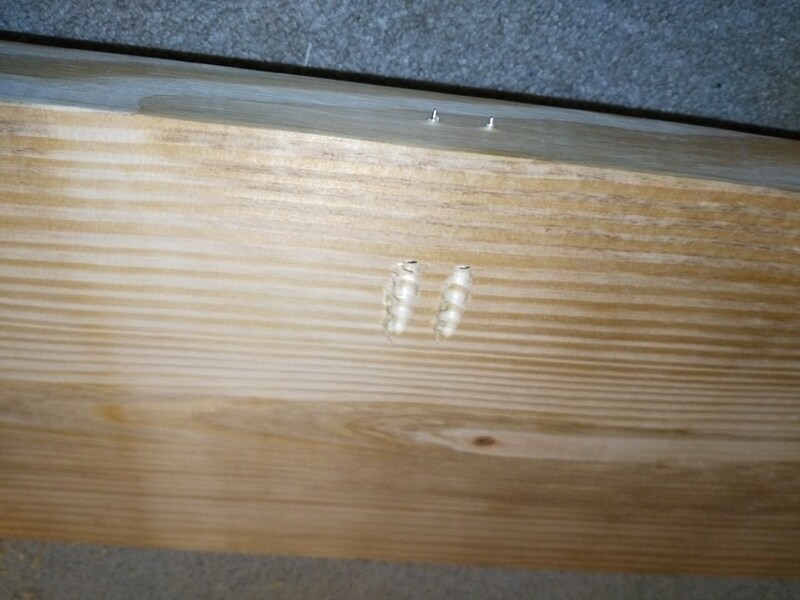 You've probably seen this before when assembling a shelf from the store - you screw the boards together and put a little plastic cap over the screw. 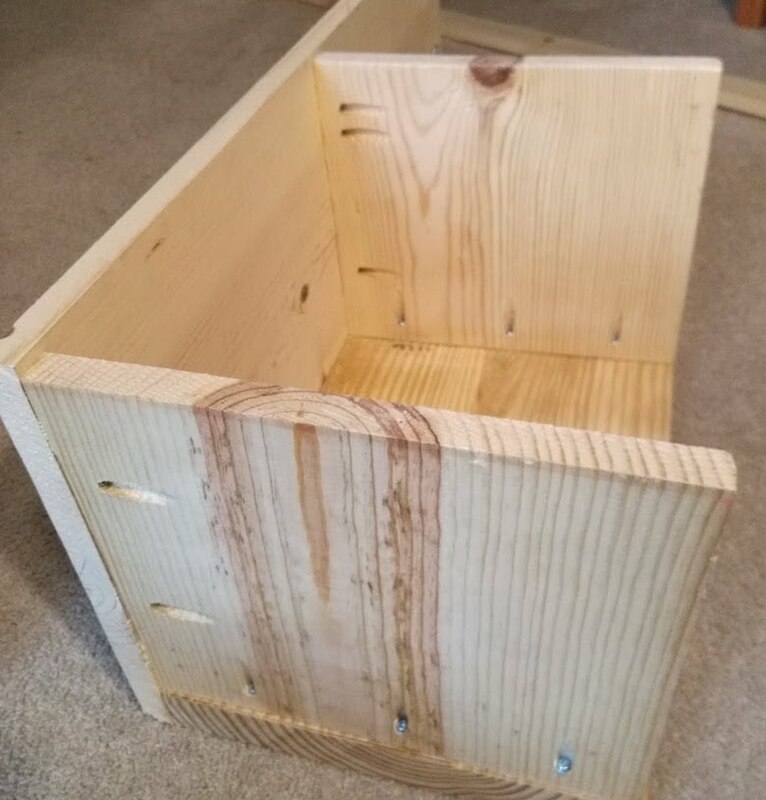 A better option is to connect the boards from the inside, referred to as a pocket hole. 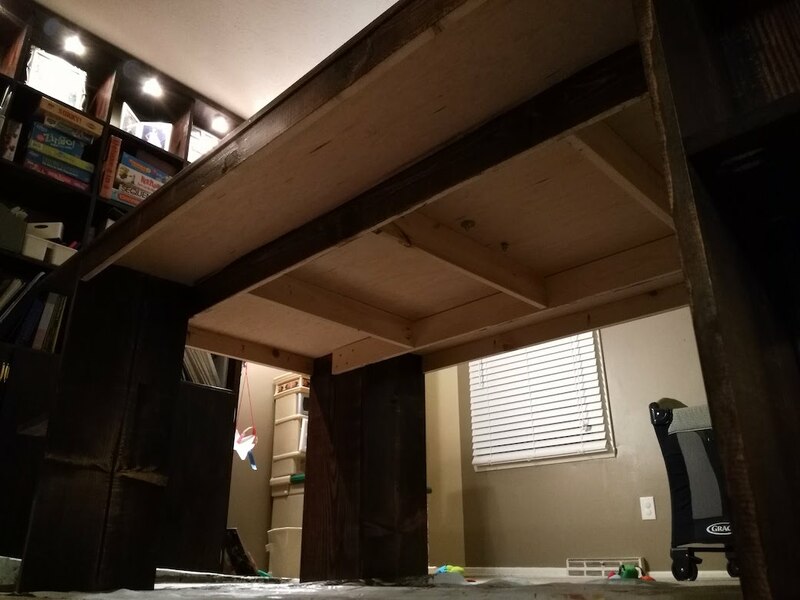 There's a lot more sophisticated setups than mine, but the Kreg Jr Pocket Hole Jig System works for what I need, and it's survived a ceiling-to-floor shelf, two bunk beds, a train table, and now this desk. Highly recommended. Here's the shelf installed - the holes are tucked underneath where no one can see them, so need to fill them in or cap them off. I mean, it's a judgment call and you could, but it makes it impossible to disassemble later if you need to (been there, done that). Here's a better shot from the side, showing how the screws come through the end of the board. Oh yeah, you'll need screws too. They're special screws with a square hole, but not really any more expensive than other screws. 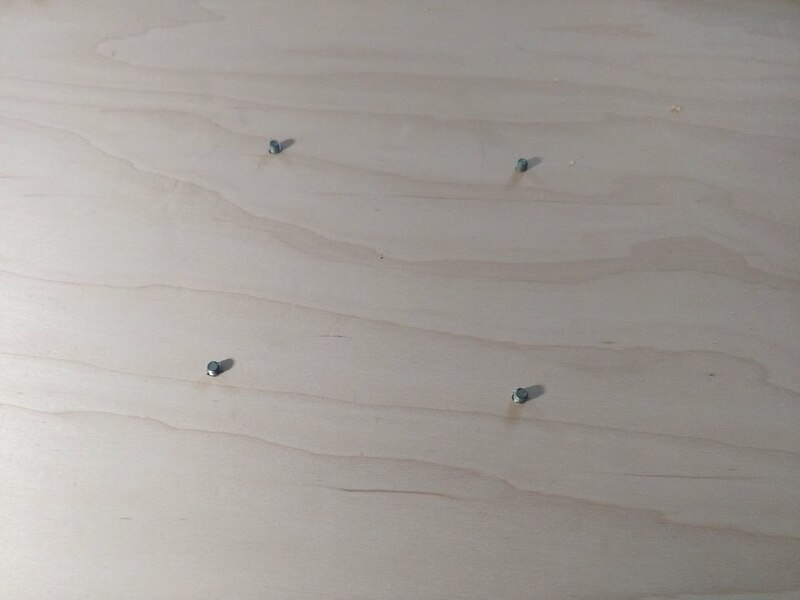 The most common ones I've needed are 1¼" pocket hole screws for connecting two boards that are ¾" thick (the actual depth of a 1" x 12" board) and 2½" pocket hole screws for boards that are 1½" thick (2" x 12" boards and similar). Here's one more shot, this time looking up from the bottom of the leg, after I installed a bottom shelf too. Once it's upright, you can't see any of this. 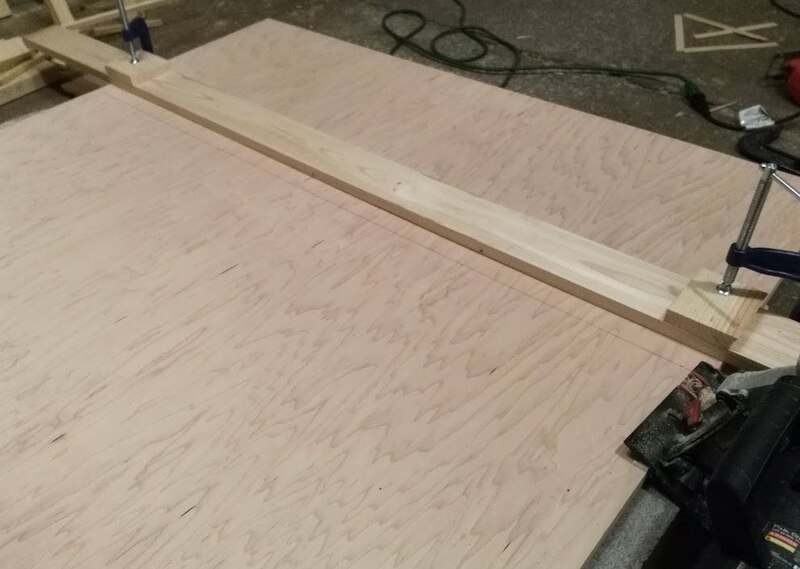 I had a long cut to make, to trim the laminated plywood I was using for the desk top. Even if I had a table saw I'm not sure this would work well, unless I could support it on the far end too. 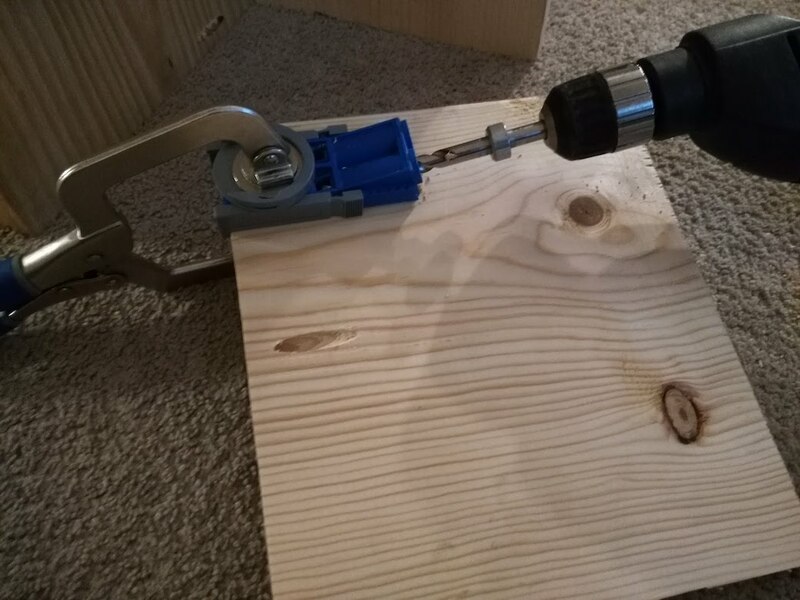 Although a table saw might be better, a circular saw can work too with a little extra setup. 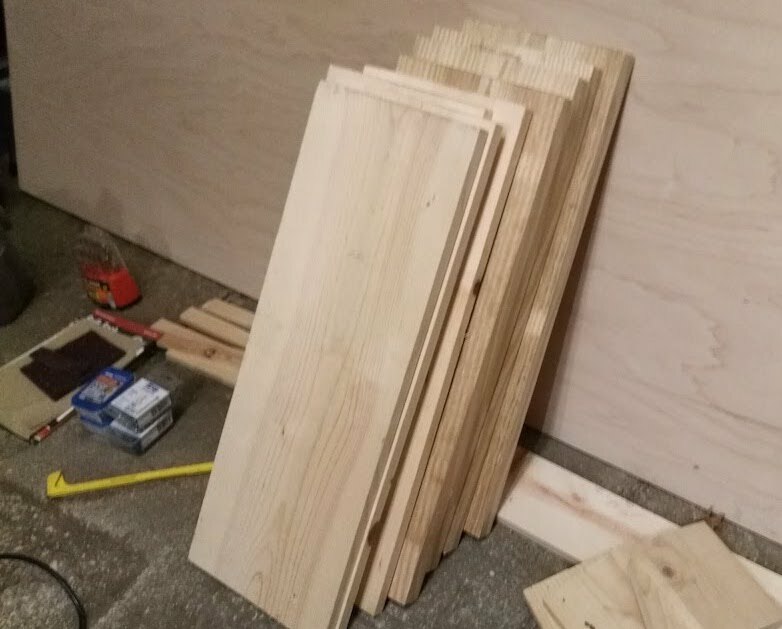 I used four blocks near each corner to lift it a few inches off the ground, measured and drew the line I wanted to cut along, and then clamped a long board 1½" from that line. My circular saw has a guide on the side that's exactly that wide (why did that sound like dr seuss? ), so I used the board as a guide to run it along. I'm happy with the result. You can buy trim pieces that are about ¼" deep (which I did) that perfectly cover up the rough edges of the plywood (not pictured here). 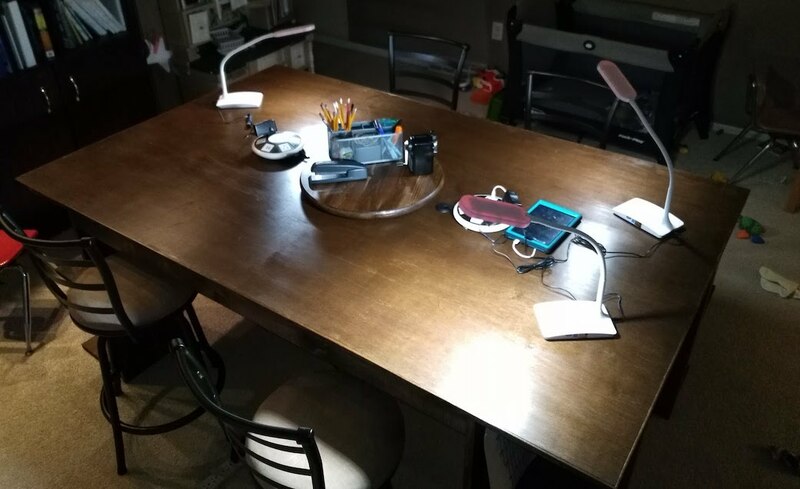 I was originally thinking I'd stick an outlet in middle of the table, to facilitate some lamps, the laptop, kindles, whatever. But Ellen suggested leaving that open to put shared supplies like pencils and markers - she's knows what they need, so I got to thinking about how I could accomodate that. I decided on a turn table setup with a 6" Square Lazy Susan underneath it. 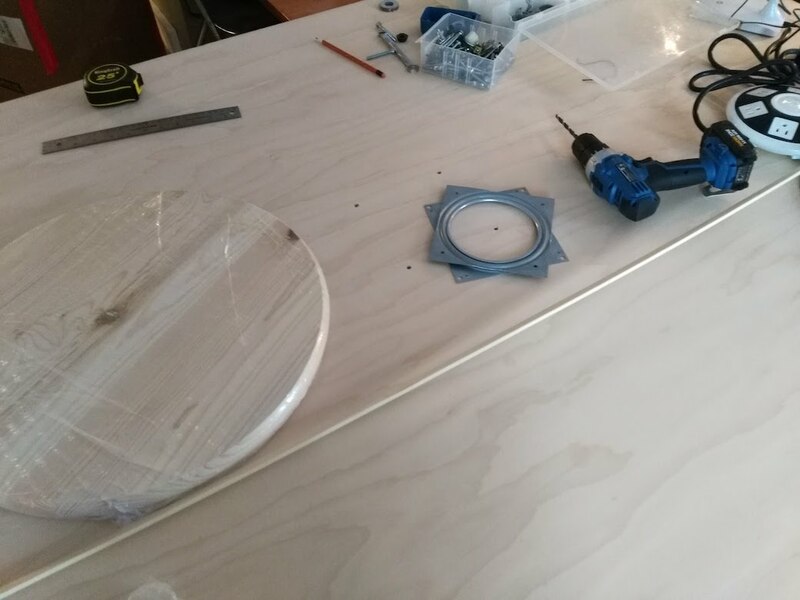 I originally considered something larger like a 12" Swivel Plate, which would've worked too since I bought a 18" circular board from Lowe's, but the smaller worked just fine and is less likely to be visible. 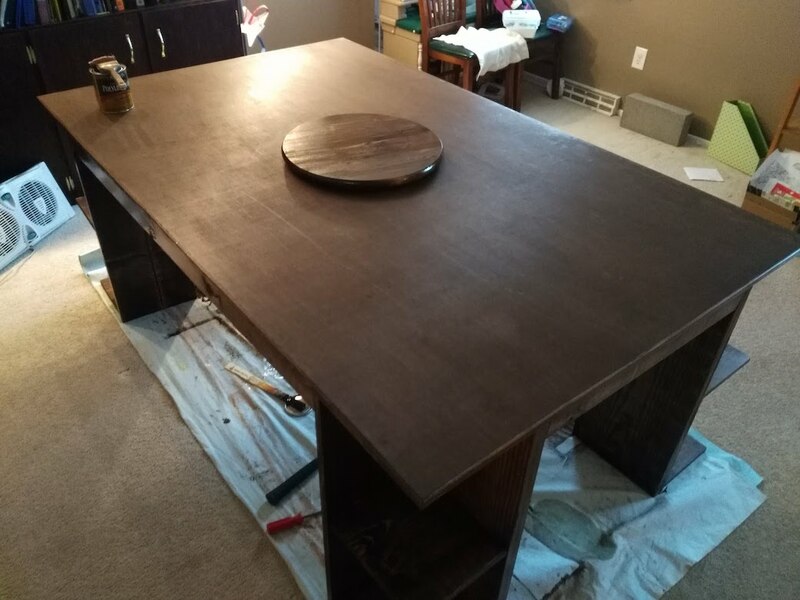 Also, despite the single poor review on that board, it worked great for me and took the stain just fine. 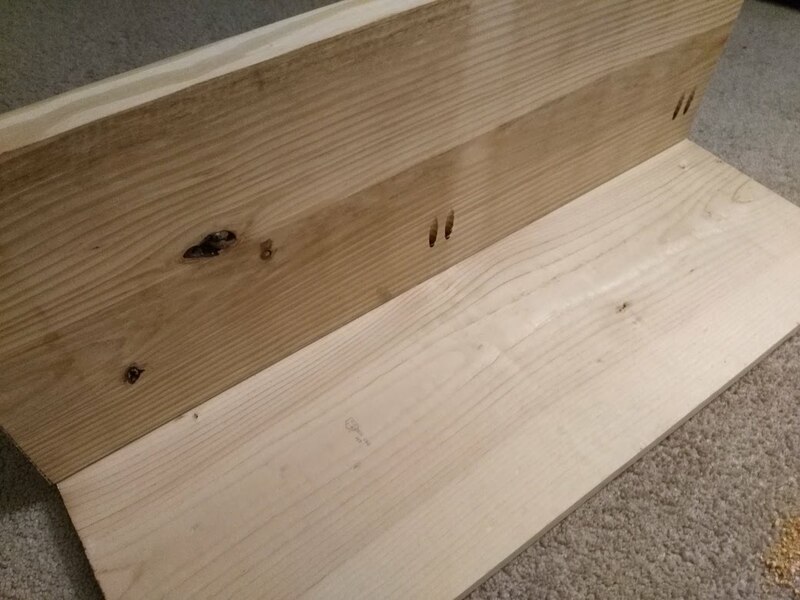 First, I drilled four holes from underneath, just wide enough to barely accomodate the bolts (not screws) I intended to use to attach the plate to the desk top. I wanted them to be held in place on their own for a bit until I got everything in place. 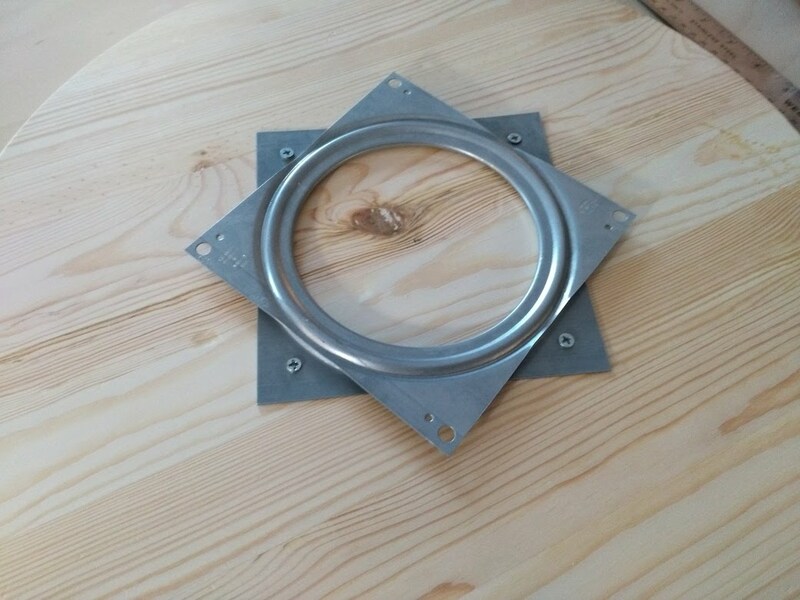 Then I secured the other side of the plate to the underside of the round board, and flipped the whole thing over and carefully placed the holes over the bolts I had inserted from underneath the desk. Maybe you can imagine my problem at this point. 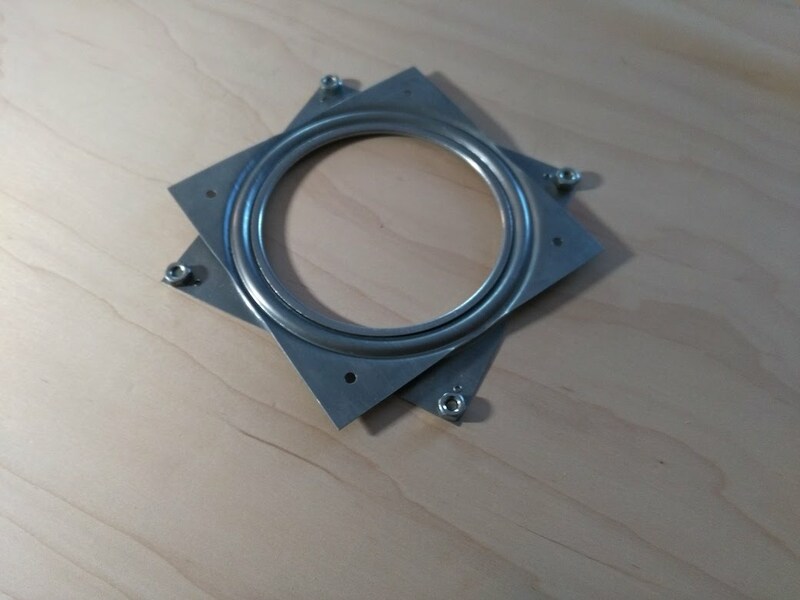 The swivel plate was secured to the underside of the board, so how was I supposed to secure it to the table too? That's why I inserted the bolts from underneath the table. 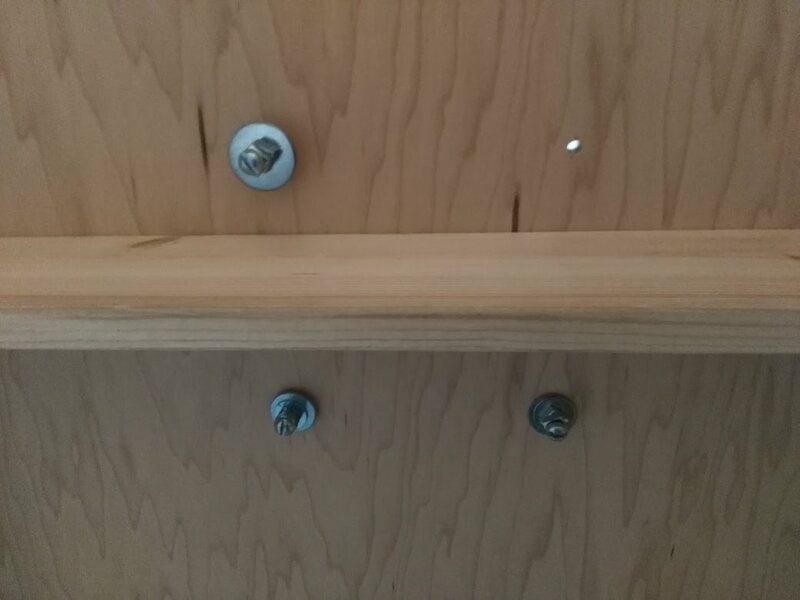 I placed the board/plate assembly on top of the screws, and used a long, thin open-ended wrench to carefully push nuts between the round board and desk top. Once I had the nut in place, I held it there with the wrench and tightned the bolt from beneath. Here it is, looking down from up above, with the round board removed again. I wanted the plate secured to the table, but faced a catch-22. I imagine using these plates with an actual lazy susan would mean taking advantage of the large hole in the middle somehow, but I wasn't about to cut a hole in my desk if I could avoid it! One more thing. 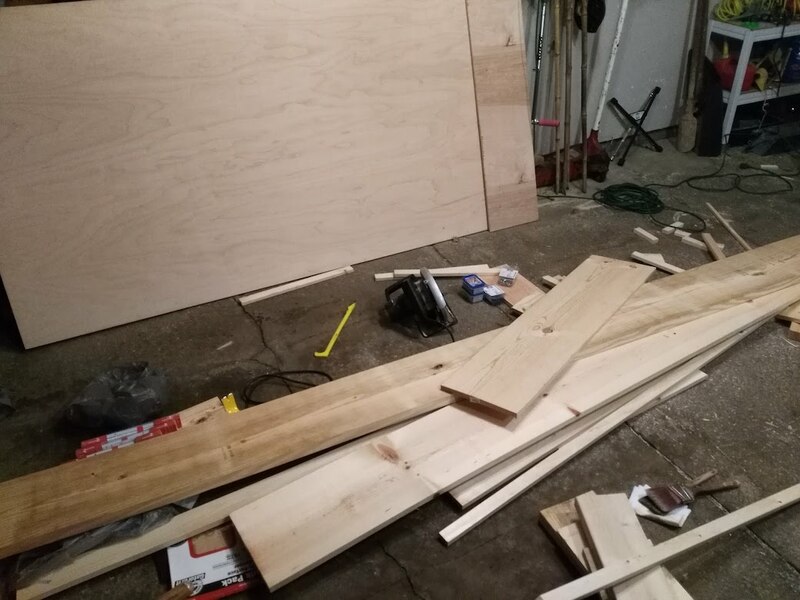 In order to minimize the large piece of plywood from wobbling, I used 1" x 4" boards underneath, running long from one leg to another, with a few more boards between them. The more boards are secured to one another, the more secure and less shaky the entire piece is. Here's the finished result, after using a couple coats of stain (dark walnut) and a coat of polyurethane. Aduro Surge Power Dome Family Multi Charging StationThese have worked out great so far. They each have 5 outlets and 2 usb ports, so phones and tablets can be easily charged too. Roundhill Furniture Round Seat Bar/CounterI wish they had been a little less expensive, but they look nice. I ended up hacksawing a couple inches off the legs because they were a bit too tall - there's rubber feet on them that can be removed, so it went fine and you can't see where I cut at all. Metal Four Tin Organizer with Handles (not shown)DecoBros Desk Supplies Organizer CaddyMy wife picked these up for the middle, and she's happy with both. All week, the kids could grab exactly what they needed without having to ask or argue. 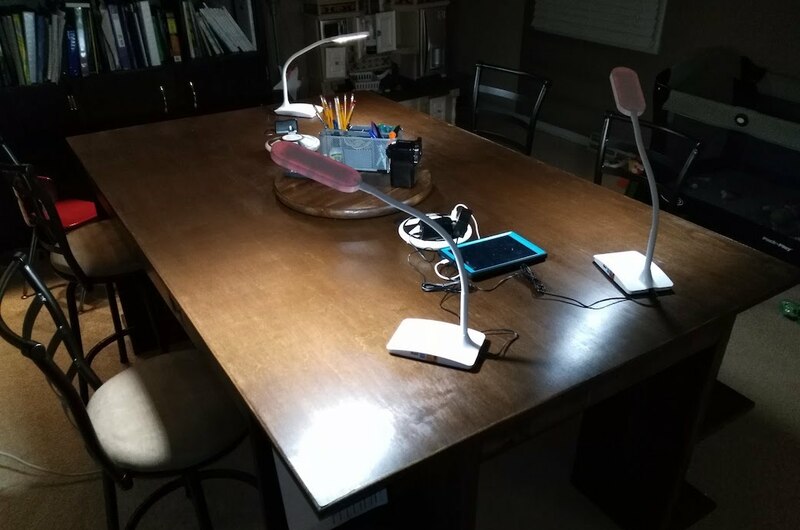 IVY LED Desk Lamp with USB Port, 3-Way Touch SwitchThese weren't strictly necessary as there's other lights in the room, but I figured the kids would like being able to light up their area when they're doing work - I was right. They look good, and add a nice touch to the "work area" motif. If you have any questions about how I did any of this, or comments about how I could have done it differently, share below! I've done a few projects, and I'm learning a lot each time, but there's so much I don't know yet.